Solid Brass Telescope on Stand 17"
Admirals Floor Standing Antique Copper with Leather Telescope 60"
Floor Standing Chrome With White Leather Anchormaster Telescope 50"
Floor Standing Brass/Wood Harbor Master Telescope 50"
Floor Standing Oil-Rubbed Bronzed-White Leather with Black Stand Anchormaster Telescope 65"
The Hampton Nautical Solid Brass Telescope on Stand 17” is a true nautical gem that is both fully functional and beautifully decorative, adding a warm seafaring shine to any room it graces. The stand has an adjustable knob to change and hold a specific direction. Focusing is accomplished by adjusting the eyepiece ring on the telescope tube, with up to 10x magnification, and a solid brass cap is included to protect the lens when not in use. The brass tripod stand features smooth, polished round legs, each with solid brass fittings. 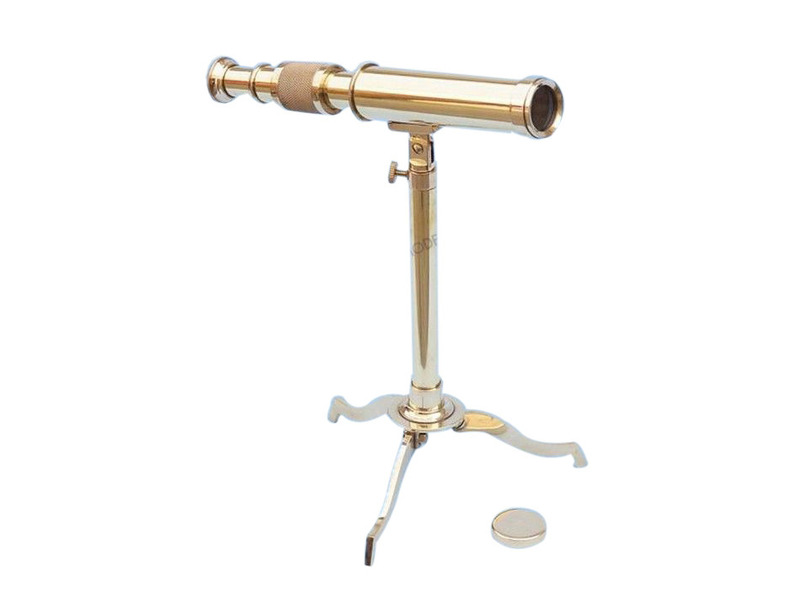 Aside from aiding in navigation and mapping, in times of war or piracy antique telescopes were also an essential tool. Used by navies to spot enemy vessels, the telescope brass spyglass allowed commanders to formulate plans of attack well before the ships were in range of one another. Giving orders to his crew, the captain was often able to utilize the telescope spyglass in range-finding for his cannons and other artillery, making firearms aboard ship much more accurate. Along with the added advantages to offense in war, the sturdy telescope brass spyglass also made signal flag communication possible and practical. Prior to its use, reading signals was often extremely difficult at distance, especially when battles began and smoke and fire filled the air, often leading to incorrect messages and orders to be announced. With the use of telescope brass spyglasses orders were understood clearer and strategy became more concise at sea. 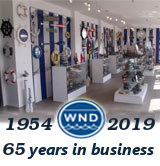 With these important advancements in sailing, the telescope came to stand symbolically for adventure and discovery, as well as power, as the earliest nautical telescopes were so expensive that only ship’s captains were privileged enough to own them.